Advertiser: The owner of the offer. If you're the owner of the offer, then you will need to create yourself as an advertiser. Offer Name: The name of the Offer. Status: Select the Status of the Offer. (InActive offers won't be able to receive Calls). 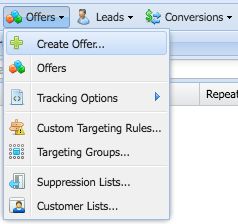 Visibility: The Offer visibility in the Affiliate Portal. Public: All Affiliates will be able to view the Offer. Private: Only Affiliates with Running Campaigns. Hidden: The Offer won't be displayed to any of your Affiliates. 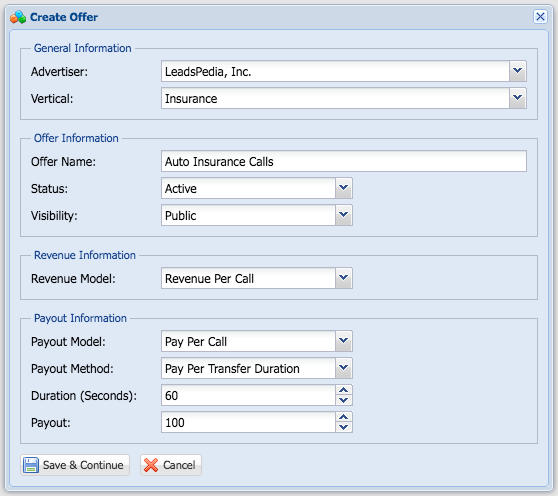 Revenue: Select Revenue Per Call. This is the default payout info for all Affiliates generating calls to this offer. Payout Model: Select Pay Per Call. Payout Method: Select how you want to compensate your Affiliates. Pay Per Call: The payout is based on an Inbound Call. Pay Per Call Duration: The payout is based on the Total Call Duration wether the call is transferred or not. Pay Per Transfer: The payout is based on a Transferred Call. Pay Per Transfer Duration: The payout is based on a Transferred Call Duration. If you select Pay Per Call Duration or Pay Per Transfer Duration, then you will need to set the default duration in seconds. Duration (Seconds): The duration to set the call as payable call. Payout: The Payout Amount for the Call.